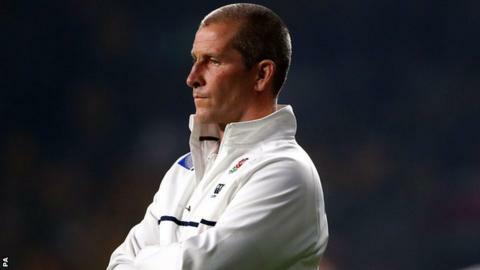 England's World Cup elimination will not prompt a "hasty reaction" over the future of head coach Stuart Lancaster, according to Rugby Football Union chief executive Ian Ritchie. England were beaten 33-13 by Australia at Twickenham to become the first host nation eliminated at the group stage. "Lessons will be learnt in a calm and thorough manner in the fullness of time," Ritchie said. Lancaster said it was "not the time" to decide on his future. "All things are being considered but not [standing down] for now for me," he said. "It's not the time to make a decision like that. "I don't think we've become a bad team but clearly we weren't ready to get out of the group." Lancaster, 45, signed a six-year contract extension last year. RFU chairman Bill Beaumont told BBC Radio 5 live's Sportsweek: "I think Stuart Lancaster is a thoroughly decent guy and he's brought a heck of a lot to English rugby. "At times like this you put your arm around him and get on with it. Stuart has a contract and all these discussions are premature. "To go out in the pool stage is obviously extremely disappointing, but we were beaten by a better team." England have one pool game remaining, against Uruguay in Manchester on Saturday. Ritchie defended England's policy of not picking overseas-based players. Toulon open-side flanker Steffon Armitage, the 2014 European Player of the Year, was the most high-profile omission on those grounds, and his absence was keenly felt against Australia as England were dominated at the breakdown. Australia revised their policy before the World Cup - and their final try against England was scored by Matt Giteau, a clubmate of Armitage in France. Ritchie said: "I spoke about it with Stuart, and we all felt that was the right policy. We continue to feel that's the right policy." Former England captain Will Carling believes there must be changes to the management set-up. "Something has to change in order to deliver better results," he said on Sportsweek. "If Stuart wants to stay, he has to deliver a new formula in his coaching team. "I look at England in the last four years - we haven't won a championship and we've had a poor World Cup. "Stuart Lancaster is a very likeable, admirable guy, but I sense we've hit a ceiling and I think we need to think very carefully about how we move forward. "We have some very talented players and, in order to move forward, we need to change the coaching set-up."